Colored Diamonds: Diamonds can occur in a variety of beautiful colors. Images in the wonderful collection of colored diamonds shown above are used with permission of IBD Fancy Colors LLC. They include from top left, going clockwise: a heart-shaped diamond with a Fancy Vivid pink color weighing 0.70 carats; a Fancy Vivid yellowish-orange pear-shaped diamond weighing 0.85 carats; a Fancy Vivid yellow radiant cut diamond weighing 0.56 carats; a Fancy Deep brown radiant cut diamond weighing 1.00 carat; a Fancy Intense blue radiant cut diamond weighing 0.53 carats; and a Fancy Vivid green radiant cut diamond weighing 0.17 carats. They represent some of the finest hues of Fancy-color diamonds. Colored diamonds are diamonds that have a noticeable bodycolor when viewed in the face-up position. Brown and yellow are the most common colors in natural colored diamonds. Diamonds with natural pink, blue, orange, green, red, and violet bodycolors are extremely rare. Out of 100,000 diamonds, only a few will have one of the extremely rare colors. The color can have any intensity between "very light" and "vivid". The color only needs to be noticeable when the diamond is in the face-up position to be considered a colored diamond. Black, gray, and white diamonds are also possible. Argyle Isla: The Argyle Isla is a 1.14-carat Fancy Red radiant-cut diamond mined from the Argyle Mine in Western Australia. It is one of the most valuable diamonds in the world on the basis of dollars per carat. It was part of the Argyle Tender Heroes sale in 2017. Image Copyright 2017 by Rio Tinto. A combination of rarity and intense public interest drives the prices of the rarest colored diamonds with a perfect and vivid hue to incredible levels. These rare-color diamonds can sell for millions of dollars per carat. They have more value for their size than almost any other material. Colored diamonds are sold at a wide range of prices. Those with less saturated or intermediate hues, in smaller sizes, and in more common colors sell for more affordable prices. Natural yellow, brown, or black diamonds often sell for prices that are not greatly different from similar-size diamonds on the D-to-Z color scale. Brown diamonds occur in a very wide and beautiful color range - from light brown gems with a "champagne" color to vivid reddish brown gems with a rich "cognac" color. Black diamonds are one of the most affordable colors, and many people enjoy them. If you can afford a diamond, you can probably find a beautiful colored diamond by selecting yellow, brown or black. An artist's sketch of a collection of rough diamonds of various colors and crystal habits once owned by Gardner F. Williams, general manager of De Beers Consolidated Mines, LTD., from 1887 until 1905. The collection nicely exhibits the colors and crystal habits of diamond. Williams was the author of The Diamond Mines of South Africa; Some Account of their Rise and Development (1905) . At the time that this collection was assembled, colored diamonds were a novelty that obviously attracted the attention of Williams; however, the marketplace did not celebrate their true rarity and price them anywhere near what they command today. Pink Pink is a rare natural color in diamonds. It occurs when the diamond is subjected to stress within the Earth, and those forces cause glide planes of carbon atom displacement within the diamond crystal. When light passes through the planes, red light is selectively transmitted. The red light appears pink when the selective transmission is weak. The selective transmission is rarely strong enough to produce a red color. 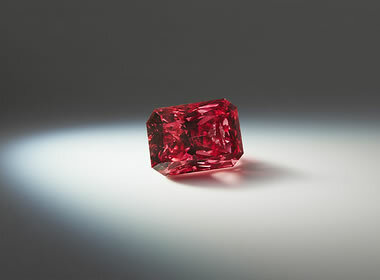 Red Red diamonds are extremely rare in nature, and they are the most valuable diamonds when in a pure hue. Like pink diamonds, they have been subjected to stress which deformed the diamond crystal lattice, causing glide planes of carbon atom displacement. When light passes through the planes of displacement, the red wavelengths of light are selectively transmitted. Weak transmission of red light will produce a pink diamond. Orange Orange diamonds are very rare. The defect(s) that produce the orange color have not been determined with certainty and may vary from one orange diamond to another. The defects in orange diamonds cause them to selectively absorb blue light and selectively transmit orange. Yellow Yellow is the second most common natural color in diamonds. The color is usually caused by nitrogen atoms substituting for carbon in the diamond crystal lattice. This defect causes diamond to selectively absorb blue light and selectively transmit yellow. Green Green diamonds are very rare in nature. The color usually develops when high-energy radiation emitted by nearby radioactive mineral grains penetrates the diamond. 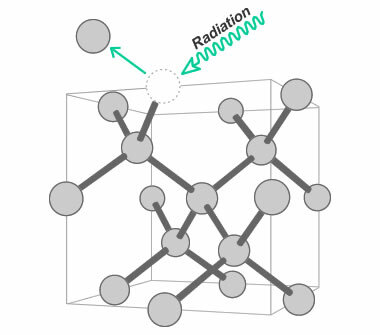 The radiation knocks carbon atoms out of their position in the diamond crystal lattice, and that defect causes the diamond crystal to selectively absorb red light and selectively transmit green. Green color can also be a result of defects produced by the presence of nitrogen, hydrogen, or nickel within the diamond crystal. Blue Blue diamonds are rare in nature. The blue color is most often caused by boron atoms substituting for carbon atoms in the crystal lattice of diamonds that have formed at extreme depths. Violet Violet is the rarest natural color in diamonds. It is sometimes caused by substitution of hydrogen in place of carbon in the diamond crystal lattice. Brown Brown is the most common natural color in diamonds. The color develops when plastic deformation creates planes of missing and displaced carbon atoms in the diamond crystal lattice. These are known as glide planes, and they are where the brown color is concentrated. They can appear as a series of parallel color bands in the diamond known as "graining". White White diamonds occur in nature when the diamond has dense clouds of fine, reflective inclusions. The numerous inclusions can interfere with the passage of light and give the diamond a translucent or opalescent appearance. Black Black diamonds with a natural color usually contain such a high density of mineral inclusions that very little light passes through the gem. Common inclusions in black diamonds include graphite, pyrite, or hematite. Black color in heavily fractured diamonds can be caused by graphitization of the fracture surfaces. Please note: The causes of color listed above are just a few of the many causes of color in natural diamonds. Numerous other natural defects can produce color. People also change or induce color in diamonds by treatments that include irradiation, heating, and coating - and by combinations of multiple treatments. There are many causes of color in diamonds, and researchers are only beginning to understand them. Colored diamonds are among the most beautiful and eye-catching gems. Many colored diamonds are purchased by people who have them set into specially designed jewelry that they intend to wear. These people love beautiful gems, and a custom-designed setting with a sparkling colored diamond is the ultimate piece of jewelry. Museums are another buyer of colored diamonds. They purchase colored diamonds when building or improving their gem and mineral exhibits. Colored diamonds are among the most popular exhibits at many museums. Gem collectors purchase a lot of colored diamonds. In fact, many museums have received their colored diamonds through gifts and bequests from gem collectors. Research institutions also buy colored diamonds for study and for their reference collections. The Gemological Institute of America has a large collection of colored diamonds that they use for study and to improve their ability to grade colored diamonds. They maintain the world's largest masterstone sets for color-grading colored diamonds. A few people purchase colored diamonds in hopes of price appreciation or to own a very small item with a very high value. Colored diamond prices have climbed steadily for the past several decades as more people have learned about them, and public interest has been fueled by spectacular prices seen in public auctions. However, there is no guarantee that this trend will continue. Anyone interested in investing in colored diamonds would be very wise to learn a lot about them and find a trusted seller who can offer them at investor prices. Le Vian, a jewelry design and manufacturing company, has trademarked the name "Chocolate Diamonds". They source brown diamonds within their "chocolate" color range and use them to produce a world-famous brand of diamond jewelry. Their "chocolate diamonds" are budget-priced, easy to find in stores, and they make the purchase of a colored diamond accessible to people who might otherwise not be able to afford them. 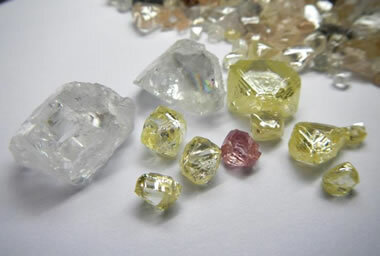 Yellow and Pink from Lucapa: Lucapa Diamonds is earning a reputation for being a prolific producer of large diamonds and colored diamonds from its Mothae kimberlite project in Lesotho and its Lulo alluvial project in Angola. Image by Lucapa Diamond Company. Natural diamond is a mineral and a rare form of crystalline carbon. A diamond composed entirely of carbon and with a perfect crystalline structure should be colorless. Diamonds that perfect rarely exist. Instead, most diamond crystals accumulate defects during crystal growth and during their long history within the Earth. Multiple types of defects can be incorporated in a single diamond. Defects in a diamond crystal can modify the way that light passes through. They can cause the diamond crystal to selectively transmit some wavelengths of light and selectively absorb other wavelengths of light. Because each wavelength of light corresponds to a different color, selective transmission and absorption determine the diamond's apparent color in the eye of the observer. Some of the most important color-causing defects are described below. 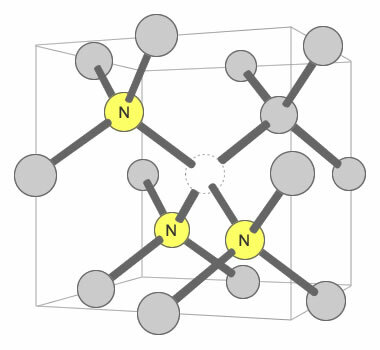 Three Nitrogens and a Vacancy Defect: Yellow color in mined diamonds can be caused by the N3 defect. It consists of three nitrogen atoms substituting for carbon atoms that surround one vacant carbon position. This defect is often accompanied by an N2 defect, and their pairing may contribute to yellow color. Illustration modified after a Creative Commons image by Materialscientist. One of the most common color-causing defects in diamond occurs when an atom of an element other than carbon substitutes for a carbon atom in the diamond crystal lattice. Substitution of nitrogen for carbon can produce a yellow diamond. Substitution of nitrogen can cause the diamond crystal to selectively absorb blue wavelengths of light and selectively transmit yellow. That transmitted yellow light reaches the observer's eye and causes the observer to perceive an apparent yellow color in the diamond. Out of all the different elements, only a few have atoms tiny enough to substitute for carbon in a way that produces color. Nitrogen, boron, and hydrogen are among the few that have the ability to substitute naturally for carbon in the diamond crystal lattice. Substitution of boron for carbon can cause a diamond to appear blue. Substitution of hydrogen can cause a violet color in some diamonds. 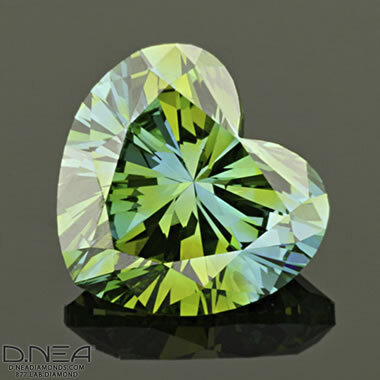 Radiation-Induced Defect: Color in green diamonds is often a result of radiation exposure. The radiation knocks carbon atoms out of their position in the diamond crystal lattice. Illustration modified after a Creative Commons image by Materialscientist. Exposure to radiation can contribute to the color of a diamond. If a diamond is located near radioactive mineral grains during its time within the Earth, it can be exposed to a stream of high-velocity particles. These high-velocity particles can knock carbon atoms out of their lattice position within the diamond. This vacancy defect can cause the selective absorption of red light and the selective transmission of green. When the transmitted green light reaches the observer's eye, the diamond will appear green. This is the cause of color in many naturally green diamonds. Pink Graining in Diamond: In this photomicrograph, you are looking into the interior of a rough diamond through a small polished window on its surface. 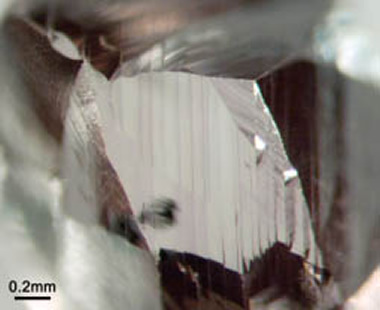 The pink vertical lines are "graining" caused by plastic deformation of the diamond crystal lattice. Each line traces a slip plane within the diamond where carbon atoms have been displaced. In this view the slip planes intersect the polished window at a right angle. Each slip plane is a defect in the diamond that causes the diamond to selectively absorb green light and selectively transmit red. Note the tiny offsets where the slip planes intersect the edges of the polished window. Photograph by the United States Naval Research Laboratory. During their formation and residence within the Earth, all diamonds are exposed to the compressional forces of the deep Earth. In some diamonds, this stress can be applied in a manner that deforms the diamond's crystal lattice by displacing carbon atoms from their normal positions. The deformation produces bands of slightly displaced atoms through the diamond crystal, known as graining. Graining can produce brown color in diamond, and in very rare instances, pink or red color. Sometimes, during microscopic examination, bands of dislocated atoms can appear as parallel color zones within the diamond. These features are known as "graining" because of their similar appearance to wood grain. Occasionally the graining is strong enough to be visible with the unaided eye. When visible at 10x magnification, the graining can be considered as a clarity characteristic in the diamond and might influence both the bodycolor of the gem and its clarity grade. The Argyle mine in Australia is the best-known mine in the world for producing diamonds colored by graining defects. About 80% of the diamonds produced at the mine are brown in color. Argyle is also the world's most important source of diamonds with a pink or red natural color. The mine usually produces a few hundred pink diamonds per year. However, in an entire decade the mine will produce only a few carats of diamond with a pure red hue. Black color in diamonds can be caused by a high density of inclusions - so many inclusions that they interfere with the passage of light. The inclusions in black diamonds are usually opaque minerals such as graphite, hematite, or pyrite. When the inclusions have a very small particle size and are uniformly distributed, they can render the diamond opaque, with a handsome black color and a highly reflective surface. Some black diamonds obtain their color from small surface-reaching fractures that have been graphitized. The name "white diamonds" is often used in reference to transparent diamonds on GIA's D-to-Z color grading scale. That usage is common, but it is not precise. The name "white diamonds" is best used for diamonds with a white bodycolor. White diamonds often contain dense clouds of very fine-grained transparent to translucent mineral inclusions that interfere with the passage of light through the diamond. These inclusions can cause the diamond to have a white translucent color, and if they are slightly reflective they can produce an opalescent "glow" within the gem. These diamonds have a truly white bodycolor and are considered to be "colored diamonds" or "Fancy white" diamonds if the quality of their white color merits these designations. Very few diamonds have a pure hue, such as red, blue, green, orange, or yellow. These are the most sought-after diamonds, and their prices are usually very high. Instead, most colored diamonds have a color that is intermediate between pure hues such as yellow and green. As an example, yellow diamonds might exhibit hints of green (greenish yellow) or orange (orangy yellow). The possible colors of diamond form a gradient of colors across the entire visible spectrum. 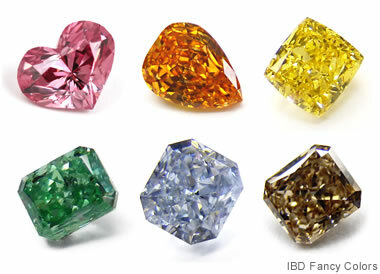 The existence of all of these intermediate colors suggests that the processes that cause color in diamonds are very complex, and that multiple causes of color can exist in a single diamond. This is what produces the incredible spectrum of diamond colors that are possible in nature. The diamonds that depart from a pure hue provide buying opportunities to the shopper. They usually sell for lower prices than diamonds with a pure hue. Buyers who like them and can afford them can obtain a colored diamond at a lower price than a diamond of premium color. Argyle Liberte: The Argyle Liberte is a 0.91-carat Fancy Deep gray-violet radiant-cut diamond mined from the Argyle Mine in Western Australia. It was part of the 2017 Argyle Tender sale. Image Copyright 2017 by Rio Tinto. One of the all-time greatest sources of diamonds, and the source of many famous colored diamonds, are the diamond mines of the Golconda Sultanate (today the Indian states of Telangana and Andhra Pradesh). These mines were the source of many important colored diamonds including the Nassak (43.8 carats, blue), Sancy (55.23 carats, yellow), Daria-i-Noor (182 carats, pink), Hope (67 carats, blue), Dresden Green (41 carats, green), Princie (34.65 carats, pink), Wittelsbach-Graff (31 carats, blue), Idol's Eye (70.21 carats, blue), Agra (31.41 carats, pink), and Noor-ul-Ain (60 carats, pink). Diamond mining began in the Golconda Sultanate as early as the 1400s and continued well into the 1600s. The most important source of colored diamonds in recent years is the Argyle mine of Western Australia. It has been the world's most important source of pink, red and violet diamonds. It is also the mine that brought brown diamonds and "chocolate" diamonds to the market. No mine can be considered an abundant source of premium-color pink, red, orange, blue, green, or violet diamonds. These colors are truly rare. However, a few mines are known to regularly produce small quantities of colored diamonds. Some of the better-known sources are summarized below by color. Pink and Red: The Argyle Mine in Australia and the Lomonosov Mine in Russia are currently sources for small quantities of pink diamonds and an occasional red diamond. The Golconda mines of India have been historic sources of pink diamonds. Occasional pink diamonds are produced at the Lulo alluvial project in Angola, the Minas Gerais area of Brazil, the Williamson mine in Tanzania, the Premier mine in South Africa, and a few mines in Russia owned by Alrosa. Orange: Orange diamonds are extremely rare, and no locality has established a name as a steady source. Yellow: Yellow is the second most common diamond color after brown. Diamonds with Fancy-grade yellow color are found in small quantities at many mines throughout the world. Green: The Golconda mines in India have been a historic source for a few green diamonds. Small numbers of green diamonds have also been mined in Brazil, the Central African Republic, Guyana, South Africa, and Zimbabwe. Blue: The Cullinan Mine (formerly the Premier Mine) in South Africa is the best-known producer of blue diamonds. 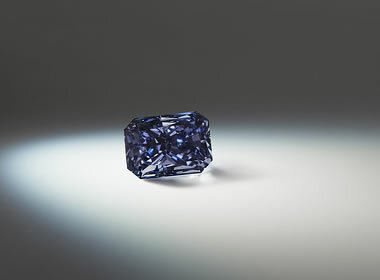 Since 2009, Petra Diamonds, owner of the Cullinan Mine, has auctioned several large (over 25 carats) pieces of blue diamond rough. Other mines in Brazil, India, Indonesia, Sierra Leone, and South Africa have been known to produce occasional blue diamonds. Violet: The Argyle Mine of Australia is one of the only sources of violet diamonds. Most of the world's diamonds with a pure violet hue have been mined from Argyle. Yet, less than 100 carats of rough violet diamond have been found in the entire history of the mine. Brown: Brown is the most common color of colored diamonds. Brown diamonds are abundant and found in diamond deposits throughout the world. The best-known mine for producing brown diamonds is the Argyle mine in Australia, where over 80% of the diamonds produced are brown. A few Alrosa mines in Russia produce significant quantities of brown diamonds. Information in the article above is concerned with the causes of natural color in diamonds. However, a large and growing number of treatments are being used to modify the color of diamonds. Treatments include: surface painting, coatings, irradiation, high-temperature / high-pressure annealing, low-pressure / high-temperature annealing, and combinations of treatments applied in different sequences. The results of these treatments vary and are strongly dependent upon the characteristics of the original diamond. Modifying the color of a diamond by treatment is a legitimate business practice if that treatment is fully disclosed to anyone who buys that diamond in the future. Any special care requirements must also be disclosed at the same time. Diamonds with a color produced by treatment should be sold for significantly lower prices than similar-color diamonds with a color of natural origin. Many buyers gladly purchase colored diamonds that have been treated and enjoy their significantly lower prices. At the same time, many buyers strongly dislike any gem that has been treated; they are only interested in diamonds with their original natural color. They insist upon full disclosure of any treatments and are willing to pay a premium price for natural-color diamonds. A brief introduction to diamond treatments and the range of colors possible can be found in a GIA article here. Secrets of the Gem Trade: The Connoisseur's Guide to Precious Gemstones: by Richard W. Wise; a book published by Brunswick House; second; 404 pages; December 2016. Diamonds and Color: Gemological Institute of America; Chapter 12; Diamonds & Diamond Grading course materials; page 13; Revised 2014 edition. The Beauty of Blue Diamonds; article on the Gemological Institute of America website, accessed October 2018. Natural-Color Blue, Gray, and Violet Diamonds: Allure of the Deep: by Sally Eaton-Magana, Christopher M. Breeding, and James E. Shigley; Gems and Gemology, Volume 54, Number 2, pages 112 to 131; Summer 2018. Black Diamonds: What You Need to Know; article on the Gemological Institute of America website, accessed October 2018. Changing a Diamond's Color; article on the Gemological Institute of America website, accessed October 2018. Characterization and Grading of Natural-Color Pink Diamonds: by John M. King, James E. Shigley, Scott S. Guhin, Thomas H. Gelb, and Matthew Hall; Gems & Gemology, Volume 38, Number 2, pages 128 to 147, Summer 2002. How They’re Made - Laboratory-Grown Diamonds: article on the Lightbox Jewelry website, accessed November 2018. Naval Research Laboratory Takes a Close Look at Unique Diamonds: by Donna McKinney; news release on the United States Naval Research Laboratory website, March 21, 2010. The Diamond Mines of South Africa: Some Account of their Rise and Development, by Gardner F. Williams; The Macmillan Company; 1902, Volume 2, frontispiece. If you are buying or selling a colored diamond, it is a good idea to have an independent laboratory examine the gem and determine: A) if the material is indeed diamond; B) if the diamond is natural or lab-created; C) if the diamond’s color is natural or a product of treatment; D) if the diamond has been subjected to any other treatments; and, E) the color grade of the diamond. In terms of color, the "ultimate diamond" has either a complete lack of color or a highly saturated color. An extremely rare diamond will occupy one of these positions. Those which approach a complete lack of color are graded on the D-to-Z color scale developed by the Gemological Institute of America. A diamond with an absence of color earns a grade of "D" and is said to be "colorless". Progressing down the scale below D, at grades of E, F, G, etc. diamonds will exhibit very small amounts of color. The color is usually yellow, brown or gray. This grading is done in the table-down position. A rare percentage of diamonds will exhibit traces of other colors such as pink, blue, orange, green, etc. If the color of these diamonds is noticeable in the face-up position, they will be considered "colored diamonds" with colors described as "faint', "very light" or "light". People familiar with colored diamonds will immediately recognize "faint" color. But, inexperienced persons might not notice "faint" color unless they receive a cue to look for it, then they will agree. Diamonds with "very light" or "light" color are much more noticeable. The names of these grades are important, and they are to be capitalized in all written communications. Diamonds in all of these grades can be beautiful, but those earning grades of Fancy Intense and Fancy Vivid are the most valuable. All of these diamonds have very rare color. Grades are assigned to colored diamonds by highly trained experts who work with the aid of colored master stones for consistency. Expert grading is very important because the color grade of a diamond can make an enormous difference in its value. Anyone who purchases a valuable diamond is wise to pay for the service of a colored diamond report. The cost of the report is very small when compared to the cost of the diamond. The best-known source of colored diamond grading reports is the Gemological Institute of America. Descriptions and fees for GIA reports can be seen here. A Laboratory-Grown Diamond with Post-Growth Color Treatment: The blue-green lab-grown diamond above had an "as-grown" orange-yellow color, then post-growth irradiation and annealing treatments transformed it into a deep blue-green color. This lab-grown diamond was produced by D.NEA Diamonds. Its GIA Synthetic Diamond Report can be seen here. Many of the earliest lab-grown diamonds were yellow in color. Earth's near-surface atmosphere is 78% nitrogen, and keeping nitrogen out of the growing process was extremely difficult. Eventually this problem was solved, and now growers have almost complete control over the diamond-growing process. Today, lab-grown diamonds with an intentional or "as grown" color are common products in the gem and jewelry industry. These diamonds are grown in environments that introduce color-causing atoms or other defects into the diamond while the crystal lattice is developing. Lab-grown diamonds are also subjected to "post growth" treatments to modify their colors. These lab-grown colored diamonds are sold in a spectrum of colors and sell for prices that are significantly less than mined diamonds with natural color - sometimes less than 1% of the cost of a similar-quality diamond with a natural color. Lab-grown diamonds give people who are unable to afford (or who prefer not to pay) the high cost of a natural diamond with natural color an opportunity to obtain a similar-looking piece of jewelry at a much lower cost. Lightbox Advertising: This is one of the early online advertisements promoting the sale of Lightbox Jewelry. It clearly communicates that lab-grown colored diamonds are offered in pink, blue and "white". We started seeing Lightbox Jewelry ads of various designs months before their products were available for purchase, and continued seeing them heavily through Christmas 2018 and Valentine's Day 2019. We saw lots of these ads on Geology.com and other websites that we visit relevant to gems and jewelry. When we visited the Lightbox Jewelry website, we would suddenly start seeing Lightbox ads at a high rate of frequency on many other websites that we visit, regardless of their content topic. 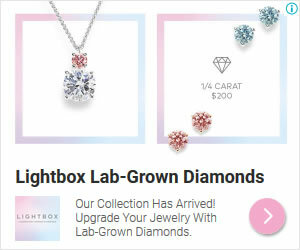 We receive no compensation for displaying the ad above, and have no agreements or relationship with LightboxJewelry.com. Element Six, a De Beers-owned company, has been producing lab-grown diamonds since the 1980s. Although De Beers has historically only sold natural diamonds for use in jewelry, in 2018 they surprised the gem and jewelry industry by breaking that tradition. In September 2018 they began selling a collection of lab-grown diamond jewelry under the Lightbox trademark. Lightbox Jewelry features pink, blue, and colorless diamonds for the previously unheard-of price of $800 per carat. These are all sold without grading or laboratory reports. They do not have the diamonds graded for two reasons: 1) to minimize the cost of the product; and, 2) they do not believe that lab-grown diamonds require grading. The goal is to sell them inexpensively for any occasion and for everyday wear. At a price of only $800 per carat, almost anyone who wants a colored lab-grown diamond can afford one. Customers can purchase lab-grown blue diamond solitaire stud earrings starting at $400 per pair. For $400, each earring contains a 1/4-carat lab-grown diamond set in 10-karat white gold.